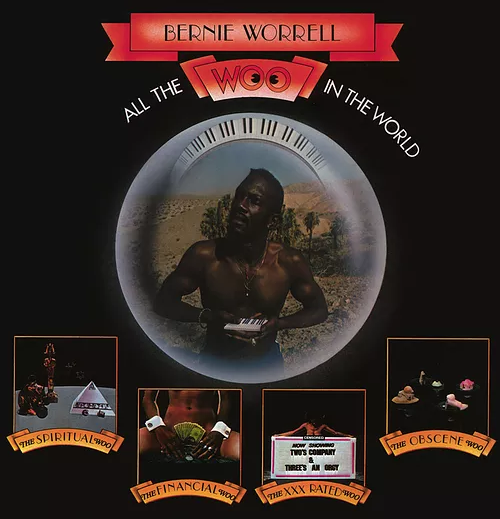 When “All The Woo In The World” was originally released on Arista Records in 1978, it was thought to possibly be a cast-off Parliament-Funkadelic record that just happened to bear Bernie Worrell’s name, giving him a long overdue début release… which is not necessarily a bad thing. Trust. Anything from that mighty concentration of musical wizards is always welcomed and ready to be consumed by all tiers of fans. All the Parliament-Funkadelic players are heard and credited here. To ignore the intricate strings, layered vocal passages, and bass playing cool running beneath the vocal directives of Worrell on the mid-tempo strut of ‘Woo Together’ is criminal. That introduction is a sneaky preface to the elongated full-on Worrell showcase on ‘I’ll Be With You’. It’s an extended listen so we get to really understand the genius behind all his legendary keyboard driven excursions. Here, we get to have 2 to 3 minutes of Worrell just running… lording Jazz, R&B, and Classical phrasing on an acoustic piano. Proving again that technology is merely an enhancer. Talent is always the first innovator. Heavily sought after by collectors, “All The Woo In The World” is an essential funk album by an artist who leaves a legacy as big as his career. Now back available as a limited colour vinyl edition with 1500 copies, released exclusively for RSD Black Friday 2017 and officially in North America for the first time since 1978. SF Music Journalist who writes for @pulplab @sfsonicmag , likes more songs about buildings and food. He's written for several Bay Area Music publications over the past 15 years.